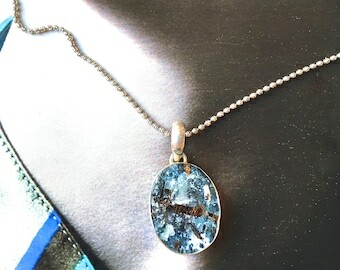 Here, you will see a variety of jewelry pieces in various styles and techniques using natural minerals and semiprecious gemstones. *FOLLOW ME on Social Media FOR SEASONAL DISCOUNTS!! 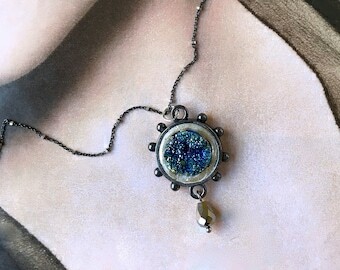 *Items can easily be added to my ETSY SHOP as a custom listing if you see something you like that is not already posted here. 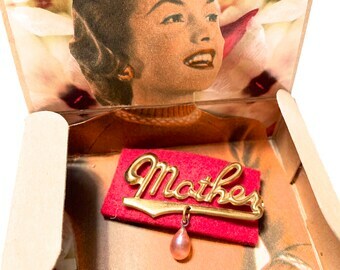 Vintage Lapel Pin in Handmade Collage Gift Box/Gift for Mother, Wife, Sweetheart/Pauletta Brooks Unique Gift under 50-Ready to Ship! Vintage Brooch Flower Pin in Handmade Collage Gift Box/Gift for Mother, Wife, Sweetheart/Pauletta Brooks Unique Gift under 50-Ready to Ship! Vintage Brooch Lapel Pin in Handmade Collage Gift Box/Gift for Mother, Wife, Sweetheart/ Pauletta Brooks Unique Gift under 50-Ready to Ship! Vintage Brooch DAISY Flower Pin in Handmade Collage Gift Box/Mothers Day Gift/ MOM Sweetheart Gift/Unique Gift under 50- Ready to Ship Free! Vintage Lapel Pin in Handmade Collage Gift Box/Gift for Mother, Wife, Sweetheart/ Pauletta Brooks Unique Gift under 50-Ready to Ship! White and Gold Beads TWO TONE Double Strand Choker Necklace- Classic, Delicate, Egyptian style Beaded Necklace - BFF Gift -Gift for Her! 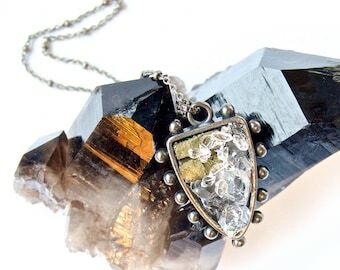 Black Cameo Art Deco Choker Necklace with Vintage Elements/Black Jeweled CAMEO STATEMENT Necklace/OOAK Wearable Art Necklace for New Years ! 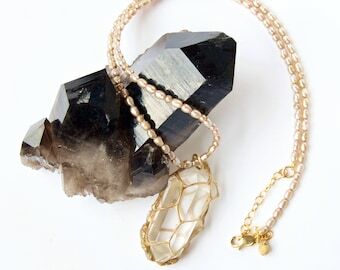 Druzy and Crystal Long Beaded WRAP NECKLACE - Druzy Mineral Layering Necklace - Delicate Druze Druzy Necklace On Beaded Silk Cord - On Sale! 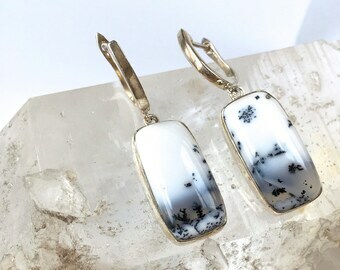 MOONSTONE Gemstone drop Earrings-Elegant Dangle Earrings-Opalescent White Mineral Gemstones in Gold Vermeil-Mother's Day+ BFF Gift for Her! 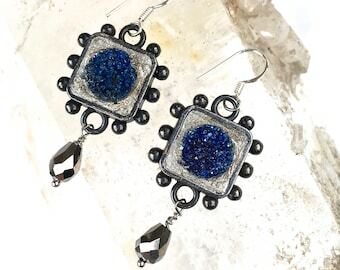 BLUE TOPAZ faceted Crystal Blue Gemstone Earrings-Classic Gemstone Earrings in Sterling Silver-Birthstones- Day to Night-Great Gift for Her! 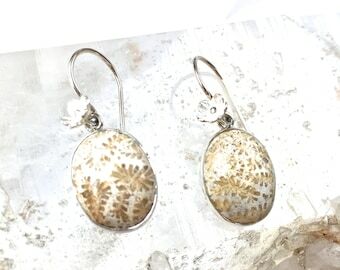 FOSSIL CORAL Earrings- Elegant Oval Earrings with silver flower detail- Delicate Dangle Earrings in Sterling Silver- Unique Gift for Her! 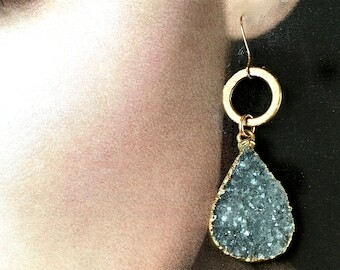 GREY DRUZY Teardrop shape Earrings - Grey Gray Druzy with Gold Circle - Dangle Drop Druze Earrings - Sparkling Statement Earrings - on Sale! 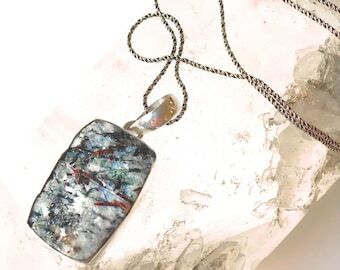 ASTROPHYLLITE DRUZY Mineral Pendant/Necklace- Oval shape Stone- Rare Mineral Pendant in Sterling Silver-Raw Mineral Pendant-Unique Necklace! Another beautiful piece for my growing collection. Thank you Pauletta for your wonderfully unique and magical designs! 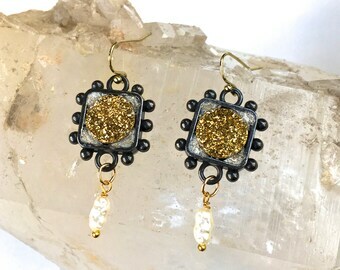 These lovely earrings are so much fun! 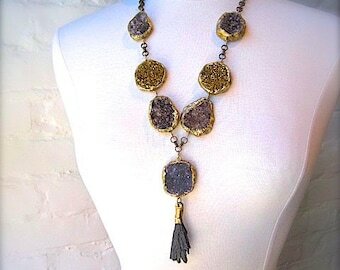 Pauletta creates beautiful things and is a most gracious and thoughtful vendor. Highly recommend this very unique shop. 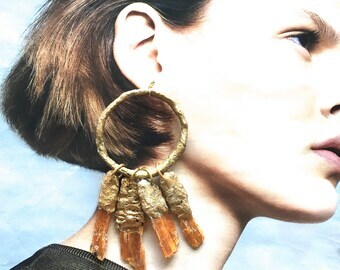 I love big jewelry and these deliver! Really lovely!!! Read the interview at OCOTUR Magazine! My work table. Never enough space! One of my favorite editorials, (in New York Magazine) from my black and gold collection, on gorgeous Sophie-Marie. 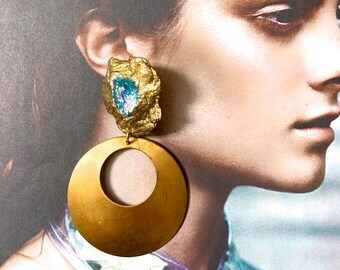 What inspires me...minerals! Look at this picture. Need I say more? After graduating college, studying art and design, I worked for many years in the fashion industry as an illustrator, stylist and art director. Then, one day, I had that “ah-ha” moment! I was asked to style a fashion show for a line of simple black bathing suits. 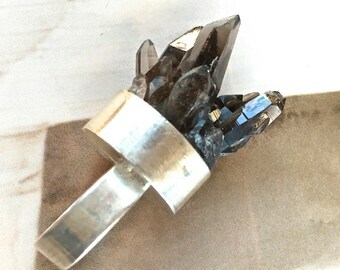 Not finding what I wanted in the way of accessories, I decided to fabricate my own jewelry to be worn by the models. Big, bold, tribal, and flowing down to the collarbone, my 26 pairs of one-of-a-kind earrings made their debut down the runway, and ultimately, were the showstopper! 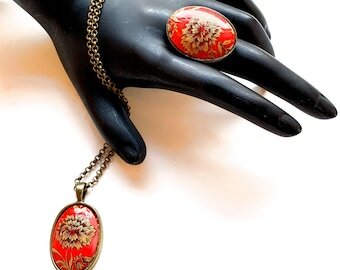 Buyers, anxious to know ‘who designed the jewelry’, placed orders and provided the impetus to launch into this new career. You can check out my other creative work at: www.SomethingFromNothingCreative.com or www.paulettabrooks.com or find me on Pinterest http://pinterest.com/pbwearableart/, or sign up for my blog: pbwearableart [!at] blogspot.com, follow me on FaceBook: Pauletta Brooks Wearable Art or find me on Instagram: @PBWearableArt !!! In any case, enjoy exploring my shop. I'm a 24/7 obsessive-creative. If I could tinker and make things all day, I would, and someday-when I untether myself from this computer, I will! If you are unhappy with any of the pieces you receive, please contact me right away. I want you to be happy and will do my best to accommodate you. Requests for returns must be made within 3 days upon receipt of the item. I will work with you to exchange any unworn items for credit or fix anything that may have been damaged in shipping. Credit will be applied when item has been returned in good condition. *ANY ITEM BEING RETURNED MUST FIRST HAVE PRIOR WRITTEN APPROVAL FROM ME AND BE SHIPPED BACK INSURED AND WITH SIGNATURE CONFIRMATION! A rental or restocking fee may apply if item is out longer than expected. 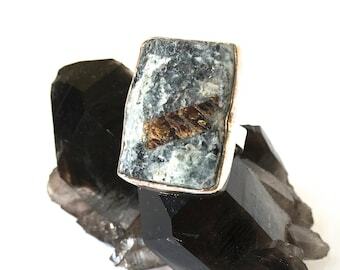 Please note that many of these pieces are somewhat delicate and handmade and the materials I use are subject to some natural flaws, especially those pieces using vintage findings or minerals. Gold in the paint may, over time, oxidize a bit or rub. 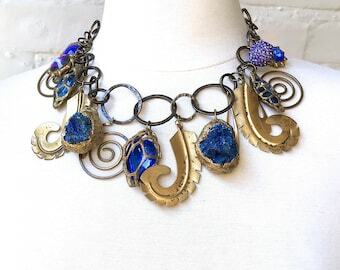 This can add an antique effect that I may intentionally add to some jewelry pieces. 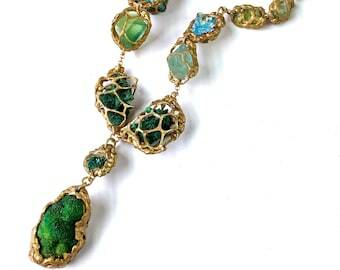 Stones and semi-precious minerals may have unusual marks. This does not mean they are "defective", just unique and beautiful, the way Mother Nature made them. 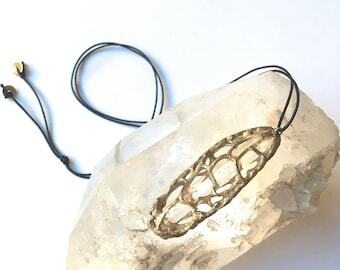 Jewelry pieces sculpted in Resin Mesh should NOT be left out in the sun or exposed to intense heat. (please read Additional Info section). If you should require any adjustments or repairs please email/convo me to discuss your issue. There may be a fee incurred. Your 'Positive' feedback is always welcomed, but if you have any negative comments please address them to me directly. I aim to satisfy! Thank you so much for stopping by and I hope you will visit often. Payment is done at time of purchase. PLEASE familiarize yourself with my shop policies. I accept payment through PayPal or Direct Pay credit cards and ship after payment clears. Personal checks, paid in advance, are accepted on custom orders. Custom orders require a deposit and sale is final. Please read all shop policies before making any purchase and if you have any questions ~ don't hesitate to ask! I print my shipping labels directly from your order on Etsy, so please verify your address before finalizing the purchase. Items are wrapped individually and usually shipped within 3-5 days. I ship USPS first class or Priority. I will use the smallest size box (often recycled) available for your order. Shipping fee overages will be refunded to you or I may notify you about any additional costs and invoice you for any additional s/h fees. I often choose to ship international orders using Registered mail which allows for tracking. You are free to have the s/h fees reduced by requesting, PRIOR TO ORDERING, that I ship only basic flat rate-BUT IN THAT CASE I WILL NOT GUARANTEE ARRIVAL OF THE ITEM(s) once it leaves my hands. And, unfortunately, I also have no control over the shipping times once it leaves my hands. Contact me for private pick up if you are in New York City. Please do not make a purchase without understanding your VAT obligations. If you have any specific instructions please make sure to notify me of them! Since sellers are unable to predict what fees, if any, will be applied, Etsy does not hold sellers responsible for unexpected customs fees or taxes. 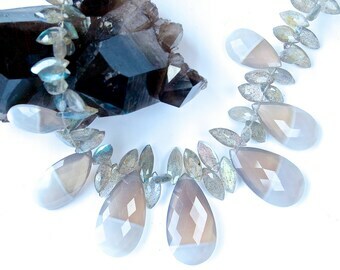 The words 'stones' and 'gemstones' may be used interchangeably in describing an item. If you are unsure of real (semi-precious) or imitation (crystal, glass) Please contact me for further clarification. Generally, the price is indicative enough of what's what! Most gold items are made with Gold Vermeil (gold over Sterling) or 14K or 18K Gold fill elements. Gold filled pieces contain 100+ times more 'real' gold than gold-plated pieces. 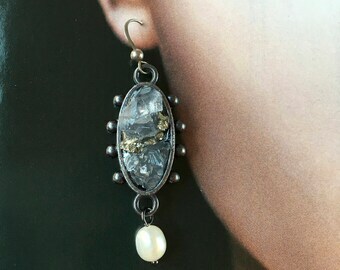 They are durable and tarnish resistant. Gold filled pieces are a high quality, affordable alternative to solid gold and best for people with skin sensitivity to gold. 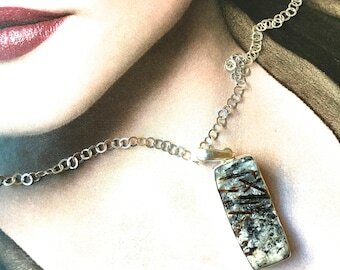 The stones used in my jewelry are selected by me and are, unless noted, 100% Natural. 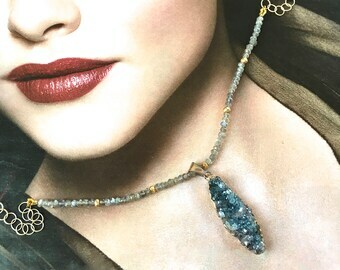 Mineral jewelry is delicate and should be treated with care!! Remove rings when doing rough or physical work, and avoid exposure to cosmetics, creams and lotions. Gold Vermeil can gradually wear, giving the appearance that it has faded. Skin and hair products can react with the plating, causing the finish to tarnish; everyday or very frequent wear may speed up this process. 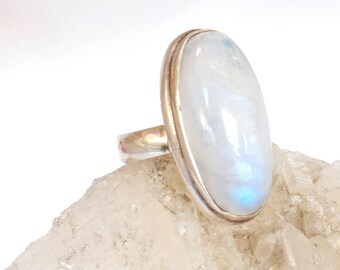 *Jewelry should always be taken off when washing hands, or in the shower, pool, or ocean. How to Contact Me: For purposes of EU data protection law, I, Pauletta Brooks, am the data controller of your personal information. 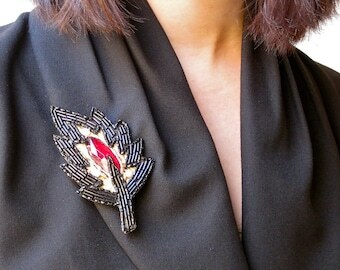 If you have any questions or concerns, you may contact me at Pauletta [!at] PaulettaBrooks.com. *If you wish to correct or delete personal information held by Etsy, you may contact Etsy at Etsy.com/help for assistance, or send a request directly to Etsy.